Add the wings and make sure everything is covered by the marinade. Place in the fridge for as long as you can (preferably overnight). 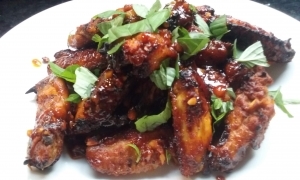 Bring the wings up to room temperature and place with half the marinade on a foil lined tray and bake in a preheated oven at 180°C/160°C fan for 30 minutes. Drain off excess oil and add the remaining marinade. Increase the oven temperature to 200°C/180°C fan and bake for a further 15 minutes. Things should be glazed and sticky with most of the marinade having evaporated. Sprinkle with fresh coriander, parsley or basil.